We receive free products to review and participate in affiliate programs, where we are compensated for items purchased through links from our site. See our disclosure page for details. Saatva’s pillow has an organic cotton outer cover and is filled with microfibers for a plush feel that your head will sink right into. But once it sinks in, you’ll find a surprise: a supportive core made from shredded latex pieces. What is the overall feel like, and who is it a good feel for? Read on for my full review. The Saatva Pillow has an organic cotton cover that is removable. Underneath is an outer pillow made up of hypoallergenic microfibers. You can unzip that pillow and reach a pouch filled with shredded Talalay latex pieces. The pillow is a good fit for back sleepers. The Saatva Pillow is made by Saatva Dreams, one of several brands in a family that includes Saatva, Loom & Leaf, and Zenhaven mattress brands. Saatva Dreams offers many bedding sleep products, including pillows, organic sheets, and mattress toppers. Learn more about Saatva mattresses here. You can also check out our Loom & Leaf review and Zenhaven review. The Saatva Pillow is a traditionally shaped pillow. 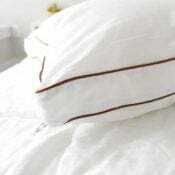 It features a 100 percent organic cotton cover with a sateen weave and brown piping around the edges. The inside of the pillow is made up of two parts. First, there is an outer pillow that is plush, fluffy, and filled with 100 percent cotton, micro-denier fibers (microfibers). There is a zipper that allows you to open up the pillow, and you’ll find a small inner core of shredded Talalay latex pieces inside. These come in a smaller bag with room for the filling to move around. You basically stuff the bag of latex shreds into a small space inside the outer microfiber pillow. This makes the core of the pillow pretty firm and supportive, but you’ll have to make sure the actual latex shreds are distributed by hand. I like to think of the Saatva pillow as the “Tootsie Pop” of pillows because of its surprise center. The core of this pillow is a small bag of shredded, natural Talalay latex pieces. Because the outer pillow is filled with fluffy microfibers that give the pillow a general down alternative feel, the supportive core is a big of surprise once your head sinks down far enough to reach it. 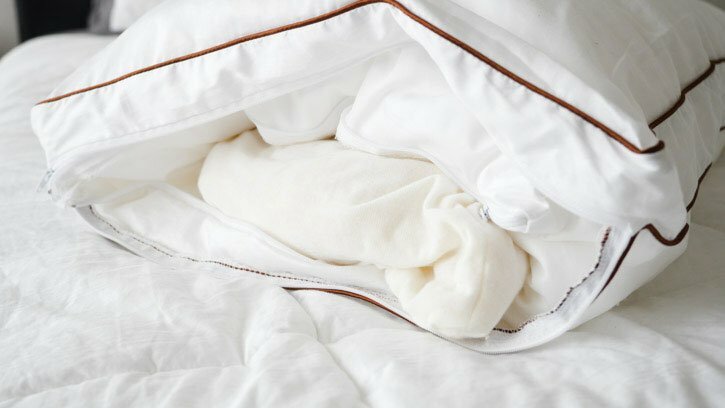 The outer cover is a very soft, 100 percent organic cotton with a sateen weave. There is a lot to like about the soft and breathable cover. It’s removable and easy to machine wash and dry. The next layer in the pillow is essentially a down alternative microfiber pillow (which is machine washable). This layer gives the pillow its plush feel and allows your head to sink into it. Your head does sink pretty far down after the first few nights you sleep on the pillow, and you will definitely feel that supportive core. Here is where I had a little bit of trouble with the pillow. The shredded latex filling is difficult to evenly distribute (because it’s shredded pieces) and can become lumpy in the middle of the pillow. There were multiple times when I had to reach my hand in and manually adjust the filling to get it even enough to feel comfortable. The support from the latex is nice, but I’d almost prefer a solid latex foam core than latex shreds. The overall height and feel make me think this pillow is best suited for back sleepers. It’s also the position in which you’re less likely to feel the lumpiness from the core. Some more petite individuals may find this pillow will also work on their side, but it’s probably too plush for heavier people who sleep on their side or those with broad shoulders and larger heads that tend to sink deeply into a pillow. I think you’ll need to plan to fluff your outer pillow/cover at least once a week to keep the plush feel going. Towards the end of my review, my head was going straight through the microfibers and hitting the firm latex foam shreds. 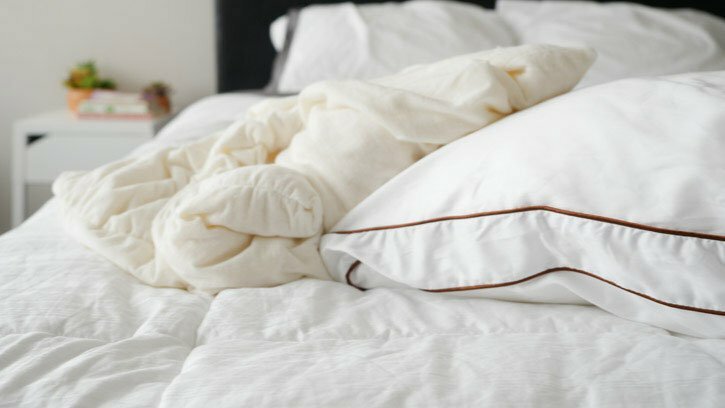 Check out our list of best pillows for back sleepers. I am a larger person than Katie and also more of a side sleeper. Because of this, I had a slightly different experience on the Saatva pillow than Katie did. She and I did agree that the pillow could be a good match for back sleepers. Even someone of my size should get the support they need on the Saatva pillow. That being said, I did not feel comfortable when I was on my side and stomach. On my side, I could feel the lumpy inner sack of shredded latex foam. It was a strange feeling, and the pillow smothered me somewhat. On my stomach, I also felt smothered. If you are a larger back sleeper, the Saatva pillow might work for you. However, this lumpy feel is worth noting. The Saatva pillow does have a lot going for it, including a soft and breathable organic cover, downy-soft and hypoallergenic outer cover, and a supportive shredded foam center. However, I found the pillow’s core too lumpy and too firm once the outer cover flattened out several nights into my review. I do appreciate that so much of the pillow is washable and that you get 45 days to try it out. If you’re primarily a back sleeper and looking for a down alternative pillow that has a foam core, you could give it a try.